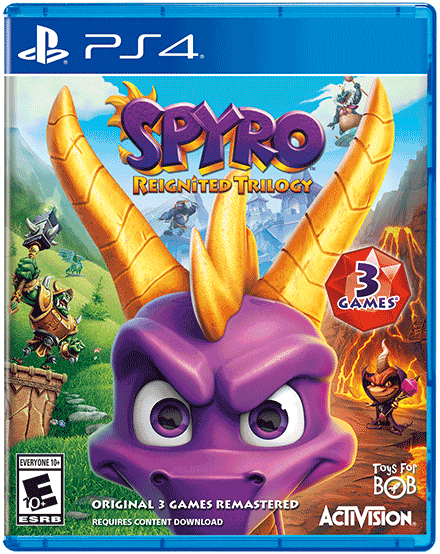 Spyro Reignited Trilogy! The new track, “Tiger Train,” reprises recognizable music motifs from the first three games into a memorable, orchestral-rock journey through Stewart's favorite themes from the original tunes that both existing and new players alike will enjoy. In Spyro Reignited Trilogy, gliding through the sky and flaring up bad guys is more fun on PlayStation® 4, PlayStation® 4 Pro and the family of Xbox One devices from Microsoft, including the Xbox One X. Spyro Reignited Trilogy launched on November 13.  Unleash the Dragon – The purple dragon that stole gamers’ hearts 20 years ago is back and looking more fly than ever in scaled-up HD graphics. Explore the expansive realms, re-encounter the fiery personalities and relive the adventure in fully remastered glory. Dragon and Avalar realms to life in more than 100 levels from the first three games. Each level in Spyro Reignited Trilogy is mapped faithfully from the originals, only now re-imagined with modern mechanics to give fans an excellent gaming experience.  Gnostalgia n’ More – This is the Spyro with swagger and personality that fans remember from their childhood. Returned and remastered Orb Challenges, mini-games and more make this an epic trilogy for the diehard Spyro-maniacs! characters, brand-new lighting, animations, environments, and recreated cinematics—all in stunning HD. analog stick support for added flavor in this one-of-a-kind adventure. Dragon Realms, toasting colorful enemies with his fiery breath and encountering countless puzzles and adventures along the way. shooting, and defeating ravenous dinosaurs. on a skateboard and stepping into a boxing ring.